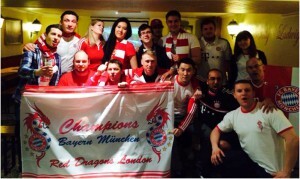 In the wake of FC Bayern’s Champions’ League triumph over Bundesliga rivals Borussia Dortmund at Wembley, like-minded fans across the city got together with the idea of creating a small corner of Munich here in England. The Red Dragons London were born. The club’s chairman Thorsten Lamberty is a Bayern fan with heart and soul. Given the lack of Sportschau or German Sky he always came to the Bavarian Beerhouse to watch the Bayern games, and soon noted that there were smaller groups and sometimes lone individuals cheering all by themselves when the likes of Arjen Robben scored a goal or Bayern progressed to the next round in the cup. On the Champions’ League evening where Bayern secured the trophy over Dortmund he concluded that with so many individual Bayern fanatics the foundation of an official FC Bayern fan club was the right thing to do. Determined by his belief Thorsten sent hundreds of messages out, and finally met Ilja Hauerhof and Erol Uray who shared the same passion for Bayern. Together they hunted for members and within a month there were twenty like-minded people. Still being short of five members short of the magic threshold of twenty-five – the number of members required to form a registered fan club – the trio asked family members to join. With Mum and Dad on the list the application went out to Bayern. The friendly staff at Bayern’s fan club department took not even twelve weeks to process the application – and this despite the department being swamped with applications after the grand Triple victory! With the club now officially being incorporated with FC Bayern the Dragons now needed a home – or, metaphorically speaking – a lair. Being well acquainted with the owners and staff at the Bavarian Beerhouse it made perfect sense to partner up with this fine pub. Having practically moved in, the Red Dragons designed tablecloths, flags and other decorations to show that they now had a genuine Stammtisch! 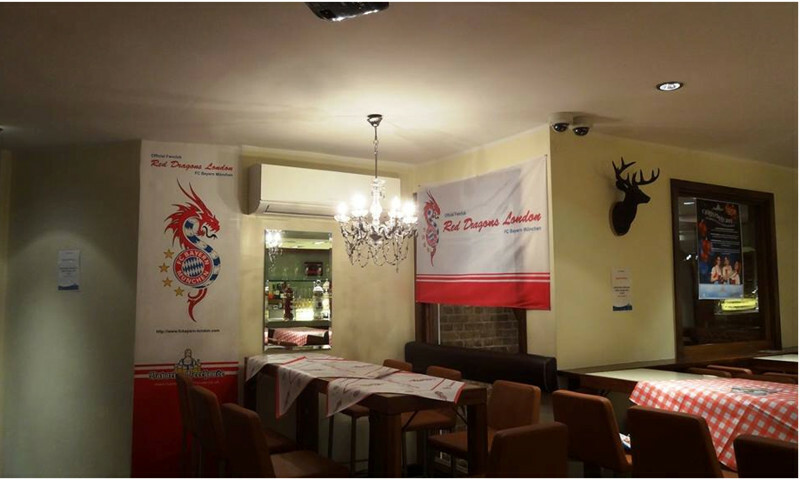 The Bavarian Beerhouse even sponsored an entire wallpaper to mark the new home of the Red Dragons London – a place where fans of Borussia Dortmund, Schalke 04 and Werder Bremen would fear to tread. Within the first half year of their existence membership figures grew steadily so that by Christmas the club counted already thirty-seven members – excluding Mum and Dad. This surge in membership applications was not only due to people recognising what great people this club managed to gather, but also the activities of the club and its increasing presence on Facebook, Twitter and in the media. For instance, the club successfully applied for tickets for game at Manchester City and organised their first event to a big match. 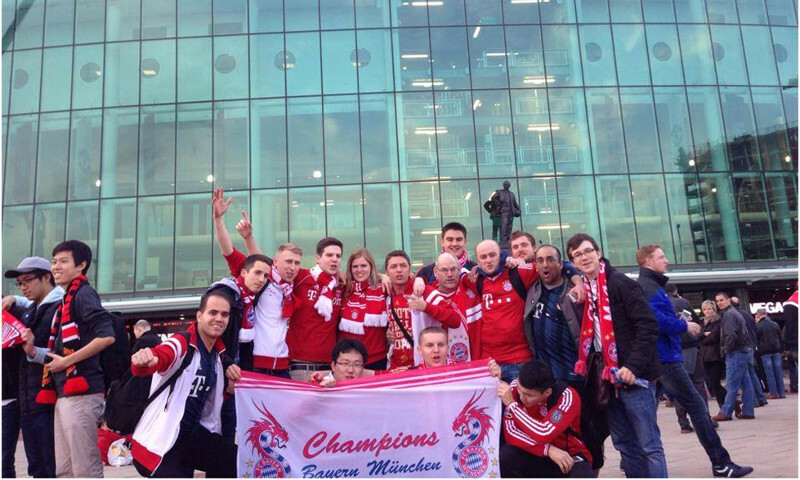 That day they were featured in the Manchester Evening News and German television channel Sport 1 as cheering, Bayern-loving fans from London. Not long time after this memorable matchday the club produced various images for the game against Dortmund and were promptly featured on ZDF, ARD and on the Muenchner Abendzeitung. As the season progressed after Christmas Bayern were drawn against Arsenal in the second round of the Champions’ League, and here the Red Dragons really made their name. 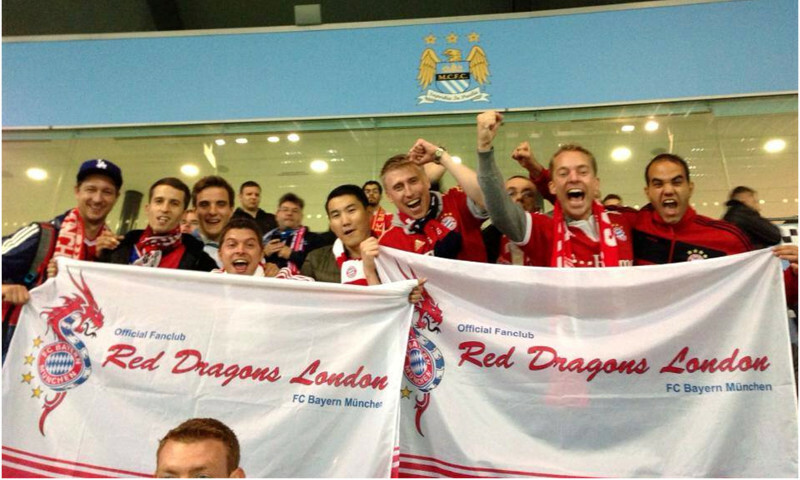 Bayern was to finally come to London! At relatively short notice the Red Dragons organised in partnership with the Bavarian Beerhouse a party for 350 (!) supporters! They also managed to get more than twenty members into the ground! 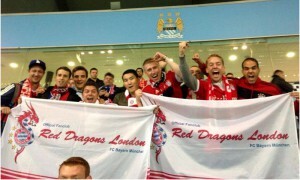 On what was a glorious evening the Bayern team returned to Bavaria with a 2-0 win, and the Red Dragons forged firm friendships with a number of other fan clubs. The next big thing was the Champions League quarter-final match at Old Trafford’s “Theatre of Dreams” against Manchester United. 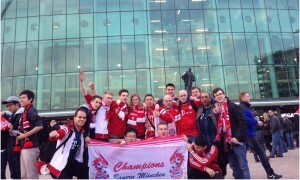 Again the team was to come to Britain and again the Red Dragons made their way to back up to Manchester by train, bus and car. Only that this time they travelled with around twenty members, meeting at least fifty friends from the previous Arsenal party. Victory over United saw Bayern take on old rivals Real Madrid in the semi-final – the latest instalment of what had become a Champions’ League classic encounter. The Stammtisch was full and around forty members saw two defeats against an overwhelming Real side. For the somewhat disappointed Dragons that meant that Borussia Dortmund in the German Cup final was Bayern’s final match of the season; confident that they would secure the title the Red Dragons once more organised a party at its Stammlokal in London, and it would be a day to remember as more than sixty people crowded the richly-decorated Stammtisch. The final against a strong and determined Dortmund side provided many moments of drama, and after a tension-filled ninety minutes the game went into extra-time. The tension was finally lifted three minutes from the end of the period period of extra time when 2013 Champions’ League hero Arjen Robben found the back of the Dortmund net, and the party well and truly kicked off when Thomas Müller added a second right at the death. Having experienced a hard-fought victory in the Berlin showpiece the victorious Dragons ordered pedicabs and embarked on a Bayern corso through the city of London – regaling passers-by with the the finest selection of songs and chants from the FC Bayern Südkurve terrace songbook. The tour ended at a club where they celebrated the entire night. 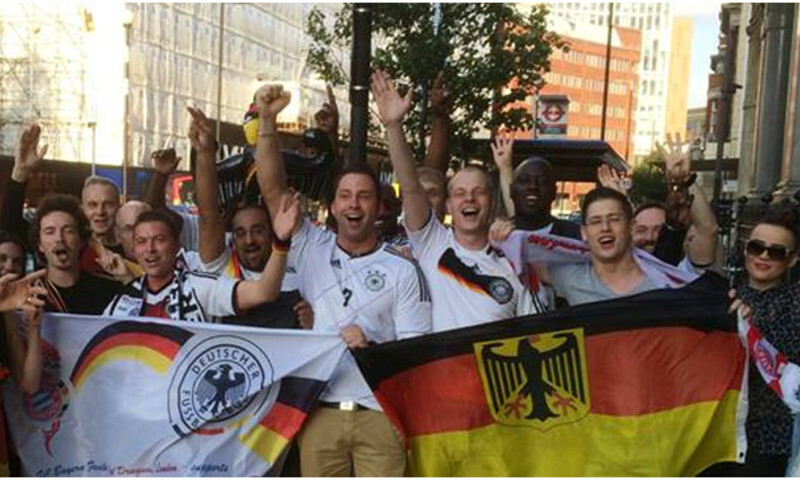 One might have thought that the journey of the Red Dragons would end on that glorious evening in May, but the momentum would be carried over into the World Cup in Brazil, where club members gathered with fellow Germany supporters to cheer on the Nationalmannschaft in their glorious march to the Maracanã and that coveted fourth star. One must not forget that Bayern had seven players in the German squad, all of whom would feature in the final – including goalscorer Mario Götze. 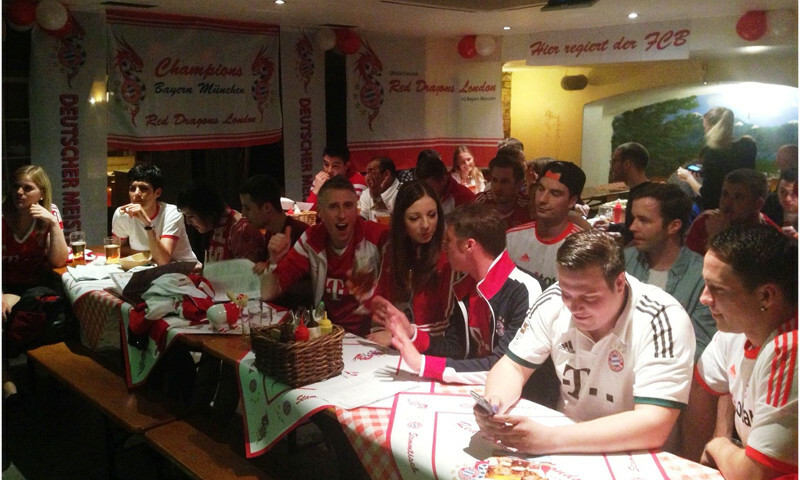 The gathering saw up to thirty of our international supporters join us in supporting Bayern & Friends and cheering them on to victory! While the players earned a well-earned holiday after the month-long tournament in Brazil, there was little rest for the Red Dragons and the Board, who almost immediately started gearing up for pre-season action. During the summer a selection of fan club members took part in an online Google Hangout organised by FC Bayern, which would gave us the almost opportunity to join other FC Bayern fan clubs around the world to speak with World Cup winner Jérôme Boateng and US international star Julian Green – all part of a perfect build-up to the upcoming season. With such a tremendous first year behind us the Red Dragons London are looking confident and optimistic towards a new season with more Bayern games, more new faces joining us in our lair and more exciting events. The story continues here! The logo was developed by Thorsten our Chairman. It is obvious that a club needs a logo but at the beginning ideas were rather scarce and circled around the “Red Devils”, “Red Knights” or “Red Tower”. Whereas the latter would have made sense as the the Bavarian Beerhouse is close to the Tower of London the sound didn’t feel right. “Look, there are the Red Towers!” didn’t seem compelling enough. But what could that logo be that is (a) compelling, (b) associated to London and (c) has enough symbolic value to represent the greatest football club on the planet? Then suddenly one evening after a match and while maundering through the streets of London it suddenly struck. There it was the London coat of arms! Two large dragons embracing a mighty shield. The idea was born! It ticked all the boxes. The Red Dragons’ name had a certain sound to it and is ultimately associated with London. Was the symbol right for Bayern? Most definitively it was! The legendary dragons are the embodiment of primordial power – the ultimate ruler of all the elements just like Bayern who dominates global football. Further, more often the fiery breath of the Bayern was felt in the opponents neck and it more than often took heroes to beat them. That would suffice and the “Red Dragons London” were born.